Between each group of like color there is at least one empty square (background color). Ctrl-Z or Backspace - undo 1 to 1000 steps back. Ctrl-Y - redo the removed steps. Shift+Left-Click - places an "X" on the clues and/or the grid area. Ctrl+Left-Click - removes the "X". Drag+Shift/Ctrl Left-Click - places/removes several "X"s.
Shift+Right-Click - places an "O" on the clues and/or the grid area. Ctrl+Right-Click - removes the "O". Drag+Shift/Ctrl Right-Click - places/removes several "O"s.
You can place "X" and "O" together in one square and get a 3rd option to mark your clues or areas on the grid. Square Counter: Place the mouse over a cell, press and hold down Ctrl. Move the mouse cell-by-cell (or many cells at once) to count numbers for you. Τοπική Αποθήκευση (Ctrl+Shift-S) - Χρησιμοποιήστε την για να σώσετε την δουλειά σας στον υπολογιστή σας (offline). Μπορείτε να τυπώσετε ένα μερικώς λυμένο παζλ ή επιλέξτε Εκκαθάριση Όλων για να τυπώσετε το παζλ με άδειο πλέγμα. Καθαρισμός όλων - Χρησιμοποιήστε το για να καθαρίσετε εντελώς το πεδίο του παζλ. Θα αφαιρέσει όλα τα τετράγωνα που σχεδιάσατε στο πλέγμα ή άλλα σημάδια που βάλατε και θα ξαναμηδενίσει το χρονόμετρο. Αναίρεση (Ctrl-Z ή Backspace) - Χρησιμοποιήστε το για να αναιρέσεετε 1 έως 1000 βήματα προς τα πίσω. Zoom In/Out με το Μεσαίο Κουμπί Ποντικιού: Πατήστε Ctrl και πηγαίνετε πάνω/κάτω. Κλειδωμένα Στοιχεία (Ctrl-L) - Χρησιμοποιήστε το για να κλειδώσετε τα στοιχεία επάνω και αριστερά. Όταν θα μετακινείστε πάνω/κάτω ή δεξιά/αριστερά τα στοιχεία θα μετακινούνται μαζί με το πλέγμα και δεν θα εξαφανίζονται. Place the mouse over a cell on the grid to view the clues of the horizontal line at the top of the screen, and the clues of the vertical line at the left, as seen in the image above. Each time you move the mouse, the ruler follows the move and shows the new horizontal/vertical clues. Reducing the size of the puzzle doesn't affect the size of the Ruler's numbers. The Magnifying Clues Ruler is optional. You can check Hide MCR (Ctrl-H) if you don't want to use it. Δείξε Σχέδιο (Ctrl-Q) - Χρησιμοποιήστε το για να προσθέσετε το σχέδιο του αγγλικού ερωτηματικού ("?") στην περιοχή του πλέγματος. Show Guides - There are two ways to show the Guides: All across the grid or only on the clue area. Check Show Guides to have them extended into the grid. Uncheck Show Guides to have them only over the clues. The system saves the selection as your default setting. Show Tooltip - Check to show the Counter Tooltip in Line and Area Mode. Χρησιμοποιήστε το για να Σώσετε τη δουλεία σας στο παζλ. If you resize the puzzle the system set this scale to be your default for all puzzles. Use Reset All (the last item on the left menu) to go back to the system's default setting. Free: Use to draw clues, background color, X's and O's freely. Ctrl-Z/Backspace or Ctrl-Y - undo or redo your moves one step at a time. Line: Use to draw straight horizontal and vertical lines. Line has a built-in counter. Ctrl-Z/Backspace or Ctrl-Y - undo or redo the whole line. Area: Use to draw rectangular areas. Ctrl-Z/Backspace or Ctrl-Y - undo or redo the whole area. If you want to remove all X's or O's you placed on the grid - use the AREA mode with Ctrl+Left or Ctrl+Right-Click. Use the Space Bar to alter from one drawing mode to another. The Palette Panel has a Drag Area. You can drag it out of the frame and make it a floating window, or place it on the top, bottom or right side of the screen. Some puzzles contain triangular clues as seen in the image. Triangle clues are keyboard key (1-9, a-z) selective as well. The icon tells you that the puzzle has triangles. If you want to change the color of a clue - Double Click on the clue or on a number ( [ 2 ] and above) in the Palette Panel. This opens a small window as seen in the picture. 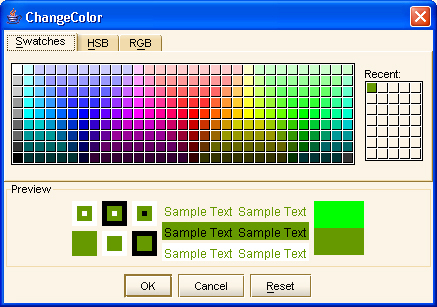 Select the color you want and click OK (or Cancel) to close the Change Color window. If you want to change the color of the background - Double Click in the background area or on the number [ 1 ] in the Palette Panel. When the puzzle is solved the colors restore automatically to the author's original selection. If you want to change the color of the solving area - Double Click on the number [ 0 ] in the Palette Panel. The system sets this color to be your preference for all the puzzles. Use the Reset Colors (under the View menu) to go back to the system's default color. This is a preview of the puzzle that you solve, while solving. The small image is updated automatically and shows the exact image of the portion you have solved.